The following are images and locations of historical markers that are located in the Village of Granville. Click on an image to see a full resolution version of the marker. Granville's citizens were early advocates of advanced education for women. By 1827, thirty young ladies attended a "Select School." The Granville Congregational Church, today's Presbyterian Church, formalized these classes and established the Granville Female Academy in 1833—first in the Old Academy Building and in 1837 on East Broadway. On this site in 1832, Charles Sawyer founded the Granville Female Seminary, a Baptist institution. The Episcopal Female Seminary purchased and used the buildings for its school from 1838 to 1861. Marsena Stone then purchased this site in 1861 for the Young Ladies' Institute, which had begun in 1859 in the Baptist church. Stone's successor was Daniel Shepardson and when he retired in 1888, the institution was renamed Shepardson College. In 1900, Shepardson College consolidated with Denison University. Built in 1842 in the Greek Revival Architectural Style for Alfred Avery from designs by Minard Lefever, the house subsequently served as a home for the Spelman (1845-1873), Downer and Cole families (1873-1902), the Phi Gamma Delta (1902-1930) and Kappa Sigma (1930-1956) Fraternities. This house was bequeathed to the Licking County Historical Society By Robbins Hunter Jr. (1905-1979) as a museum of the 19th Century. National Register of Historic Places. Built by William Stedman in 1816 of local stone, this building served as the Bank of the Alexandrian Society, which printed its own currency. The bank failed in 1817 and 1837. This building has also been used as a store, post office, and interurban railway depot. It was enlarged and opened as a museum during Granville's Sesquicentennial Celebration in 1955, and was listed on the National Register of Historic Places as part of the Granville Historic District in 1980. On this bluff lies one of the two great animal effigy mounds built by Ohio's prehistoric people. Shown here, Alligator Mound is a giant earthen sculpture of some four-footed animal with a long, curving tail. Archaeologists believe the animal is perhaps an opossum or a panther, but not an alligator. The earthwork is approximately 250 feet long, seventy-six feet wide, and four feet high. Like the Great Serpent Mound in Adams County, Ohio, Alligator Mound is not a burial mound. The Newark Earthworks, built by the Hopewell people between 100 B.C. and A.D. 400, are three miles to the east. Scholars do not know who built Alligator Mound, but it may be the work of the Hopewell. The Granville Congregational Church erected this building in 1833 for its Female Academy and a church meeting room. The school prospered and, in 1837, moved to make way for the Granville Male Academy. The Welsh Congregational Church purchased the structure in 1863 and converted its two stories into a single room with full-height windows. Welsh language services were held here for sixty years. Granville Grange #2230 met in the building from 1923 to 1973. It then became Granville Historical Society's property and, in 1981, was listed on the National Register of Historic Places. Opponents to slavery met at the academy during the 1830s and 1840s. In 1834, Theodore Weld, a zealous abolitionist, proclaimed his then radical views here. A mob gathered outside and pelted Weld through the windows with eggs. In 1841, a dramatic trial within these walls contested whether a runaway slave could be extradited from Ohio and returned to the south. Judge Samuel Bancroft ruled that Ohio's extradition law was unconstitutional. The partisan crowd ushered the man to a waiting horse and he hurried north. The Old Colony Burying Ground has many signed and masterfully carved monuments and gravestones that provide a history of gravestone motifs between 1808 and 1880. Found within this ground are excellent examples of the work of local carvers and sculptors, including Thomas and Rollin Hughes, Manley Whipple, and the DeBow brothers. The early markers are of locally quarried sandstone, while many of the later ones are of marble, which was shipped to Granville via the Granville Feeder from the Ohio and Erie Canal. In 1886, Charles Webster Bryant recorded and numbered the location and epitaphs of all visible gravestones, providing important historic information no longer visible today. The cemetery has been called the Old Colony Burying Ground since 1912 when the wrought-iron entrance gates were erected by the Granville Chapter of the Daughters of the American Revolution. The Old Colony Burying Ground was listed on the National Register of Historic Places in 2005. 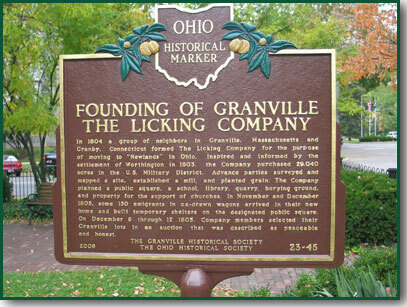 In 1804 a group of neighbors in Granville, Massachusetts and Granby, Connecticut formed The Licking Company for the purpose of moving to "Newlands" in Ohio. Inspired and informed by the settlement of Worthington in 1803, the Company purchased 29,040 acres in the U.S. Military District. Advance parties surveyed and mapped a site, established a mill, and planted grain. The Company planned a public square, a school, library, quarry, burying ground, and property for the support of churches. In November and December 1805, some 150 emigrants in ox-drawn wagons arrived in their new home and built temporary shelters on the designated public square. On December 9 through 12 1805, Company members selected their Granville lots in an auction that was described as peaceable and honest. [PLAT] The Partition Deed of the Licking Company reads "There shall be laid out A Town Plat in the most eligible part of said tract of land…." The town site chosen was sheltered by the hills with copious springs, but open to the south on the second terrace above a branch of the Licking River. Today's village streets reflect the original plan with its "Broad Way" and connecting roads to Lancaster, Owl Creek (Mt. Vernon), and Worthington.